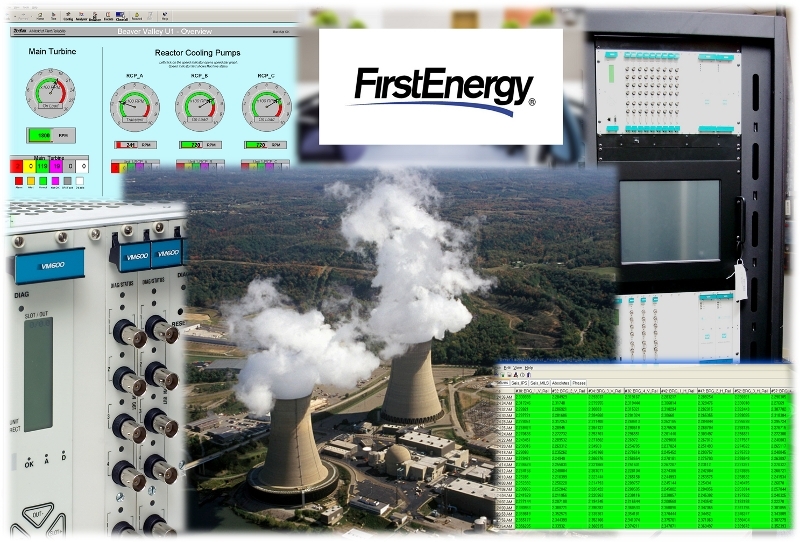 The Beaver Valley nuclear plant of First Energy, located just north of Pittsburg, PA, has completed a project to replace turbine supervisory equipment with a new VM600 system, designed, supplied and commissioned by Zeefax. This new all digital system replaced the existing obsolete BN3300 system, which was monitoring the Main Turbine and the Reactor Cooling Pumps. The Beaver Valley nuclear plant of First Energy, is located just north of Pittsburg, PA, and has two large steam units; Unit 1 is 970 MW and Unit 2 is 920 MW. Zeefax designed, supplied, commissioned and support a replacement supervisory and condition monitoring system for Unit #1, based on the VM600 system from Vibro-Meter. The new system replaced the existing obsolete BN3300 system, which was monitoring the Main Turbine and the Reactor Cooling Pumps. The new seismically rated free standing equipment cabinet was designed to fit directly into the limited space made available following removal of the existing equipment. Zeefax designed the new wiring scheme, provided a comprehensive set of installation drawings, and supervised the installation on site. The new combined Protection and Condition Monitoring system includes absolute vibration monitoring, by vectorially combining relative and seismic vibration sensors, and also an all new phase monitoring module, which extracts the 1st order phase information for each bearing from the VM600 system and presents it to the unit operators on the customized touch screen display, for inclusion in the daily reports. This new VM600 system was intended as a direct replacement for the old existing system, whilst taking advantage of all new digital technology. Zeefax provided all of the engineering design, integration, testing and installation supervision for this system.